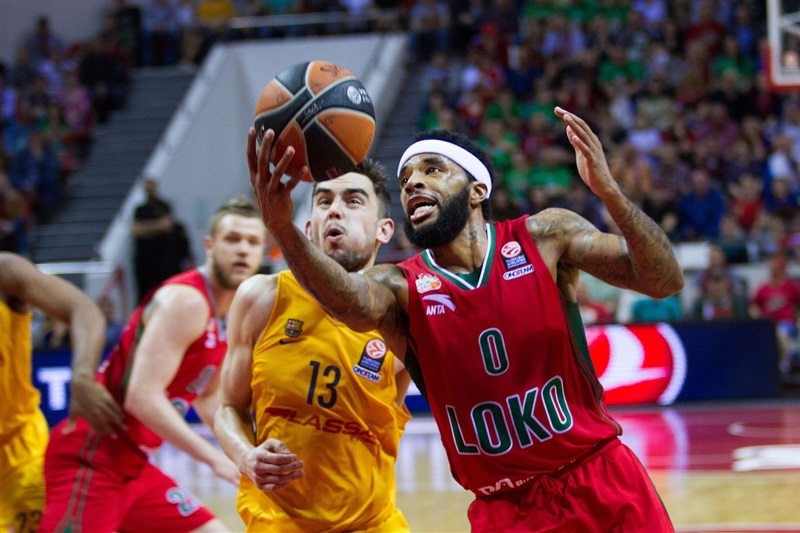 Lokomotiv Kuban Krasnodar found a new fourth-quarter hero Tuesday in coming from behind to defeat FC Barcelona Lassa 81-67 and claim a spot at the 2016 Turkish Airlines Euroleague Final Four in Berlin. 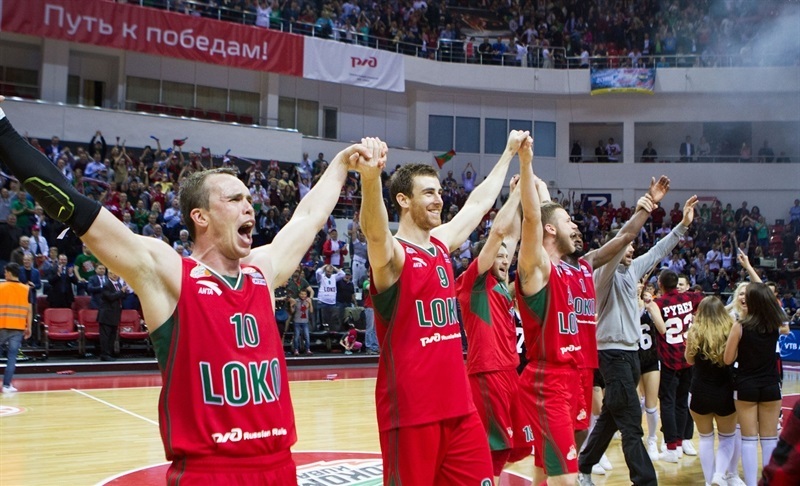 Lokomotiv won the best-of-five series 3-2 and ended the visitors season. 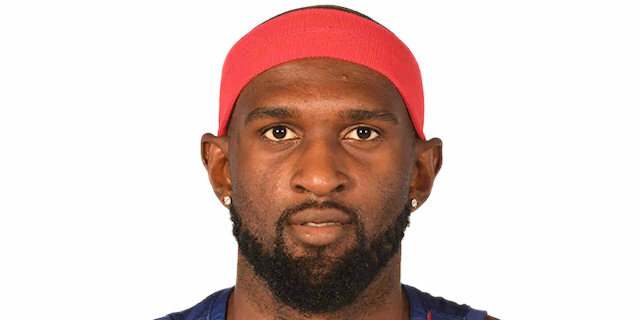 Down 5 early in the fourth quarter, Chris Singleton drained back-to-back threes to ignite a 14-0 charge in which he scored 11 and assisted on the other three and Barcelona never recovered. 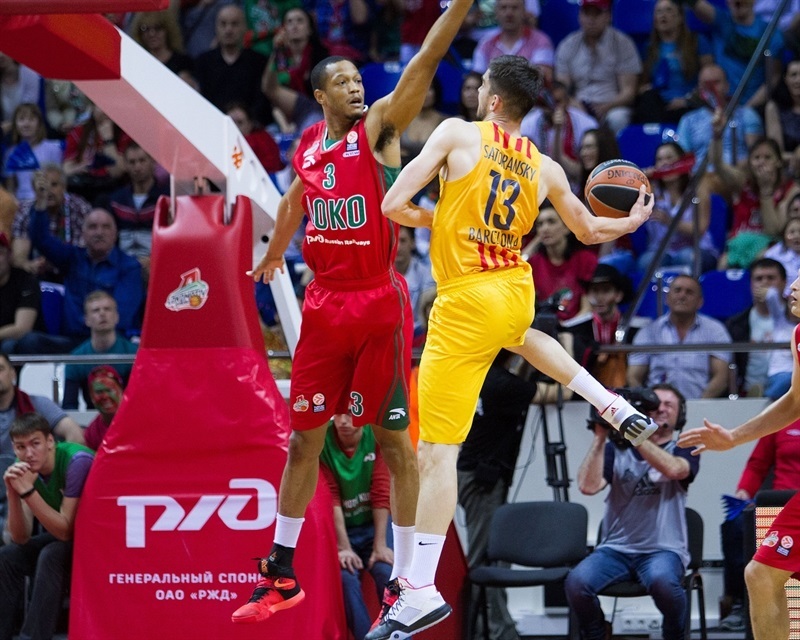 The momentum had been in Barcelona’s favor after it held Lokomotiv to 8 third-quarter points in rallying from an 11-point halftime deficit, but ran out of steam early. Malcolm Delaney tallied 17 points on 3-of-3 three-point shooting plus 6 assists as the team made 13 of 25 triples (52%). Singleton posted 16 points and 12 rebounds, Ryan Brokehoff was 4 of 6 from downtown for a series-high 14 points and Matt Janning added 8 of his 10 points in the fourth quarter. 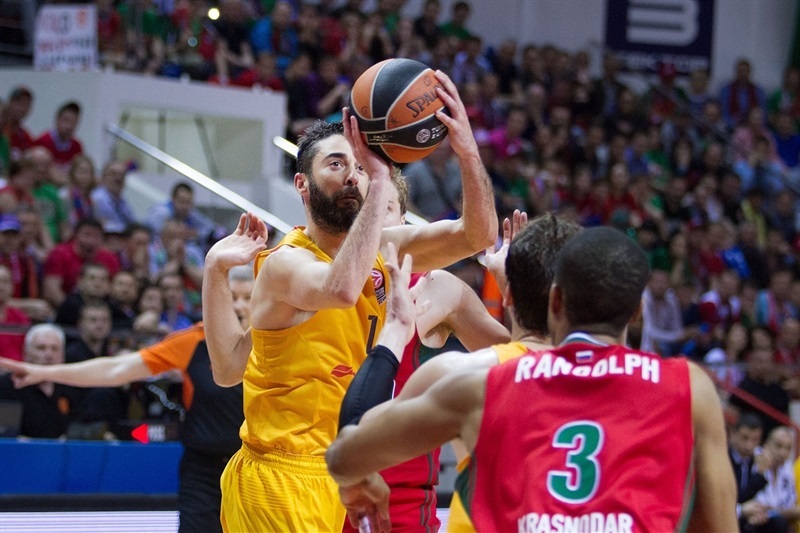 Stratos Perperoglou paced the Barcelona attack with 13 points, Juan Carlos Navarro added 12 and Tomas Satoransky contributed 8 points and 7 assists. Anthony Randolph drilled a three-pointer on the game’s first possession before Perperoglou got the visitors on the scoreboard with a drive inside. Delaney took charge with a floater and an assist to Evgeny Voronov for a slam. Brokehoff broke out of his slump with a three for a 10-2 Lokomotiv start. 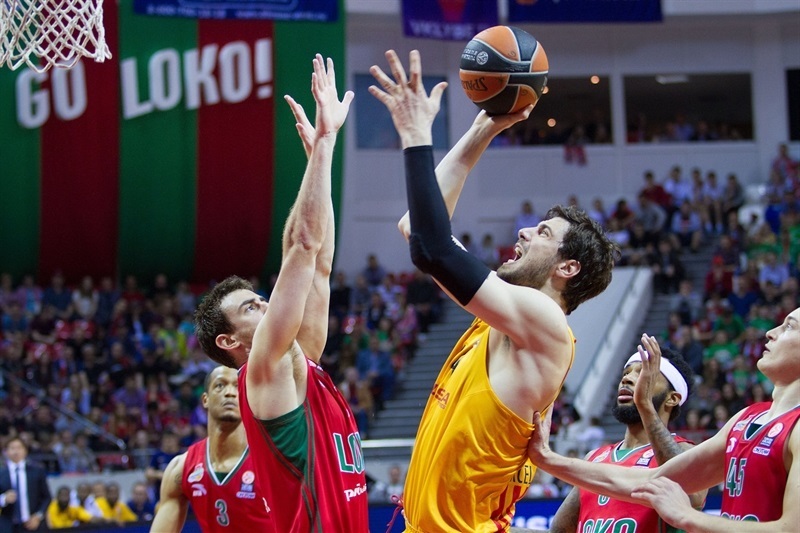 Barcelona regrouped as Perperoglou knocked down a three and Ante Tomic scored inside. The lead was back at 8 after a Randolph jumper and another Broekhoff three. Satoransky fired in a three, but a Delaney shot with his feet on the three-point line made it 17-10 after five minutes. After the TV timeout, Justin Doellman closed the gap with free throws and Perperoglou made a layup in transition. Randolph fired a pass to Voronov for a layup, but Navarro started to get involved for Barcelona; the scoring king drew a foul and buried a jumper on the next play. Voronov connected on a step-back triple to make it 22-16. 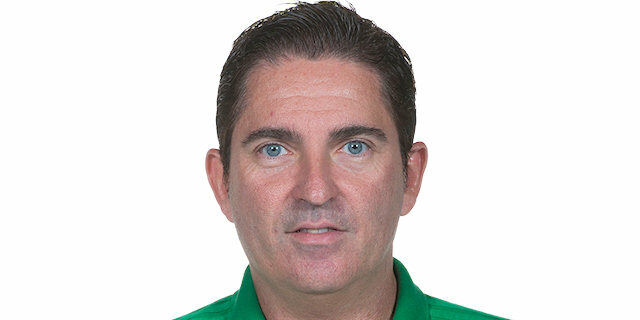 Both coaches went to their benches with five total substitutions at the 2:21 mark. Randolph added another jumper and Joey Dorsey, who missed the previous three games for Barcelona with an injury, was called for an offensive foul. Alex Abrines kept it close with a three, but Sergey Bykov beat the shot-clock buzzer with a baseline jumper. Abrines’s fast break slam on the closing seconds of the quarter made it 26-21. Dorsey sank free throws and Abrines’s floater bounced in. Brad Oleson knocked down a three to cap a 0-9 Barcelona run and give the visitors their first lead, 26-28. Matt Janning put back his own miss to even the score. Dorsey fouled Bykov and then was called for an unsportsmanlike foul for shoving Bykov. Shane Lawal made his return from injury to replace Dorsey. 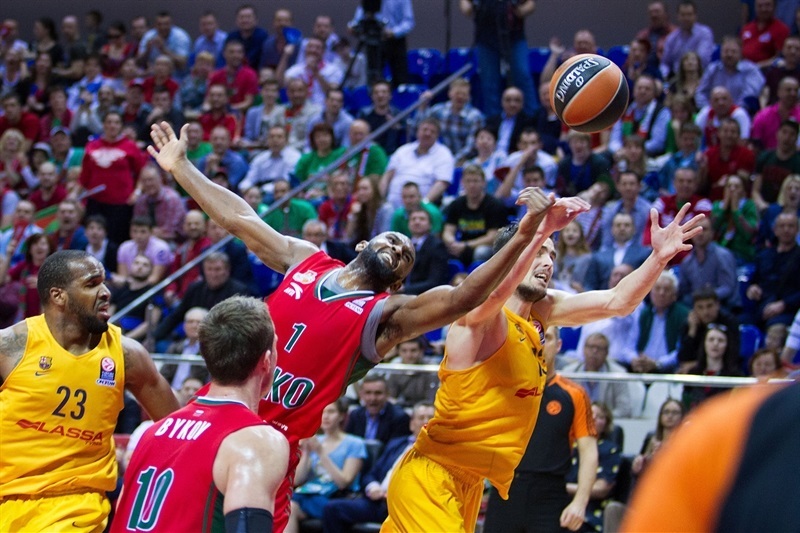 Free throws by Bykov and Singleton restored a Lokomotiv lead. Lawal committed 2 quick fouls and Dontaye Draper added free throws. Delaney’s jumper extended Lokomotiv’s 9-0 run and made it 35-28 midway through the quarter, after which Barcelona used a timeout. A Doellman jumper ended a nearly four-minute long Barcelona drought, but Bykov’s fast break layup and Delaney’s layup in transition put his team ahead by 9. Fresh off the bench, Samardo Samuels muscled his way to a score, but Delaney made it a double-digit lead with a three from the corner. Barcelona bounced back as Navaro netted free throws and Satoransky took a steal in for a slam. Broekhoff countered with his first slam and Singleton put back a wild miss by Delaney got a 47-36 advantage. Samuels drew a foul inside and split free throws and then dunked, but Delaney ended the half with a three-pointer for a 50-39 halftime advantage. Navarro got things going a minute into the second half with a three-pointer. He followed that with his second triple to close the gap to 5. After a 24-second violation, Lokomotiv called timeout. Navarro assisted on a Satoransky triple to make it 50-48. 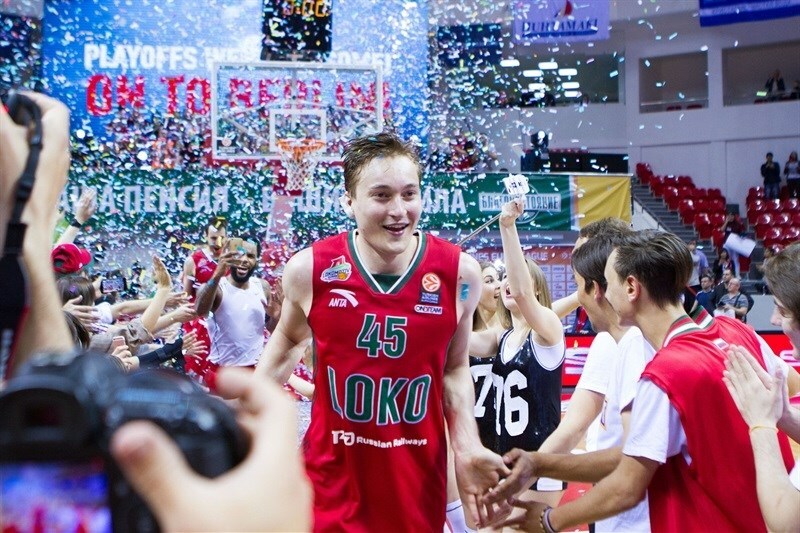 It took more than three-and-a-half minutes before Broekhoff’s mid-range jumper gave Lokomotiv its first points of the half. Tomic scored in the paint, but Randolph countered with a jumper. The difference was again 2 after Tomic free throws. Broekhoff and Perperoglou traded threes before Navarro fed Tomic for a slam that tied it at 57-57. Navarro free throws pushed his team ahead and a Perperoglou triple completed a 0-10 charge. Victor Claver split free throws for his first point, which ended the quarter at 58-62. 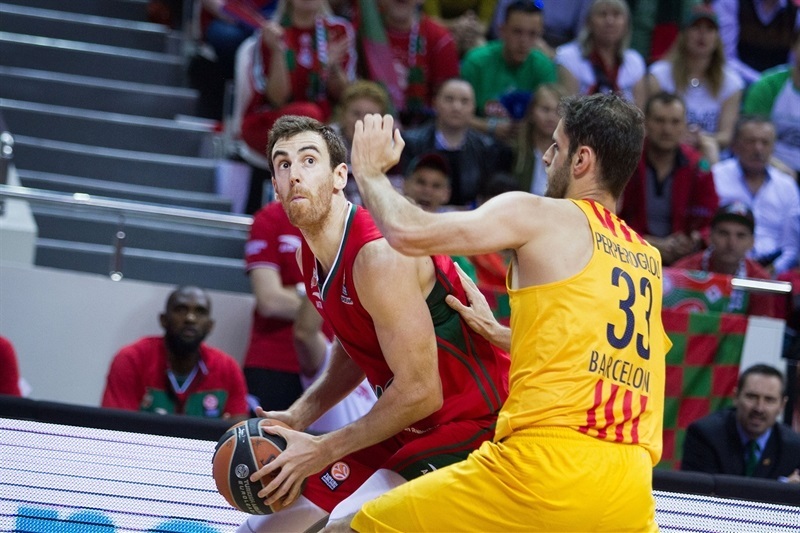 Singleton split free throws and Abrines padded the Barcelona lead with a step-back jumper. Singleton drew his team within 2 with a three-pointer. 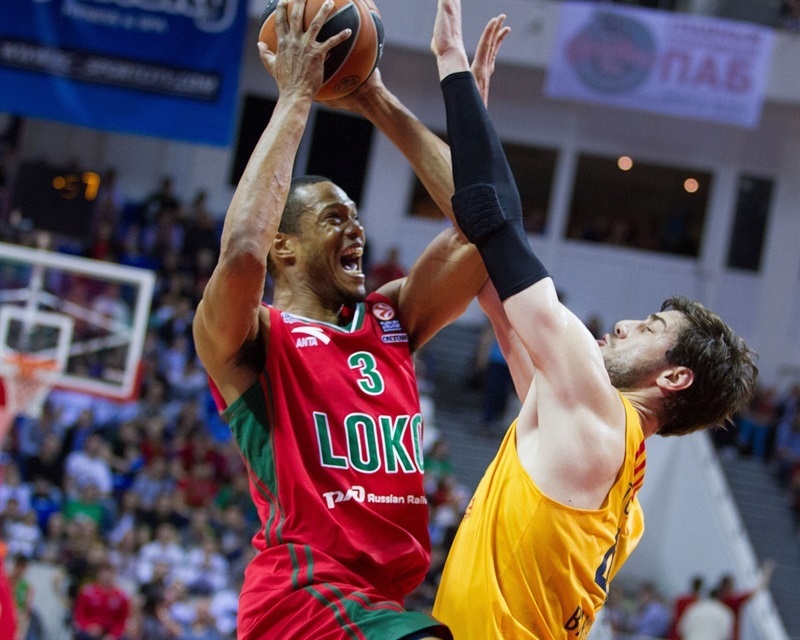 After a Barcelona timeout, Singleton put Lokomotiv up 65-64 with another three. Doellman missed twice from the line and Singleton converted a reverse layup and foul and then another layup. After scoring 11 consecutive points, Singleton found Janning for an open three in transition and a 73-64 lead. 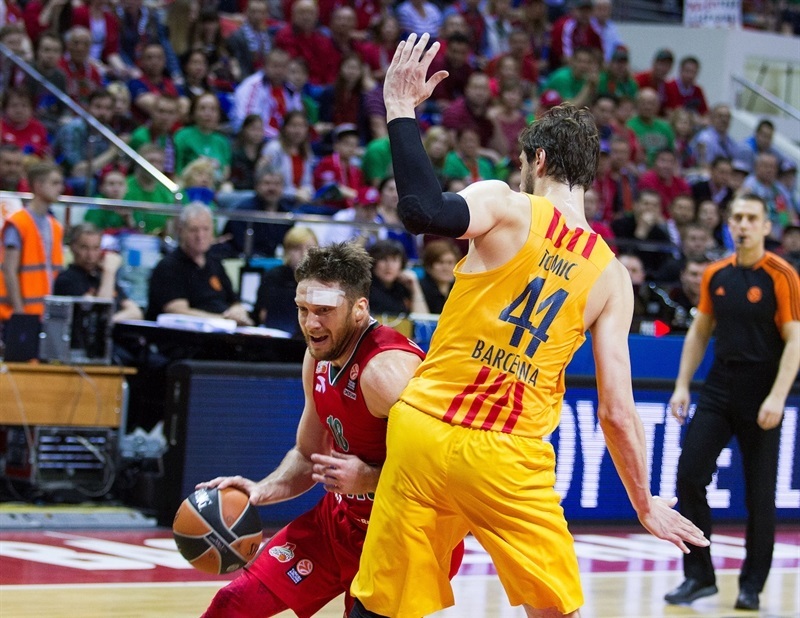 Draper fouled out and Oleson sank 3 free throws to end a five-minute Barcelona drought. However Janning busted the Barcelona zone with a three and Tomic missed twice from the line. As Barcelona’s offensive woes continued, Janning all but sealed the outcome with a floater before a Delaney triple with 38 seconds left ignited the celebrations. "A big day for our club, for the city of Krasnodar. We are so happy we gave such pleasure to our fans and everybody who loves this team. 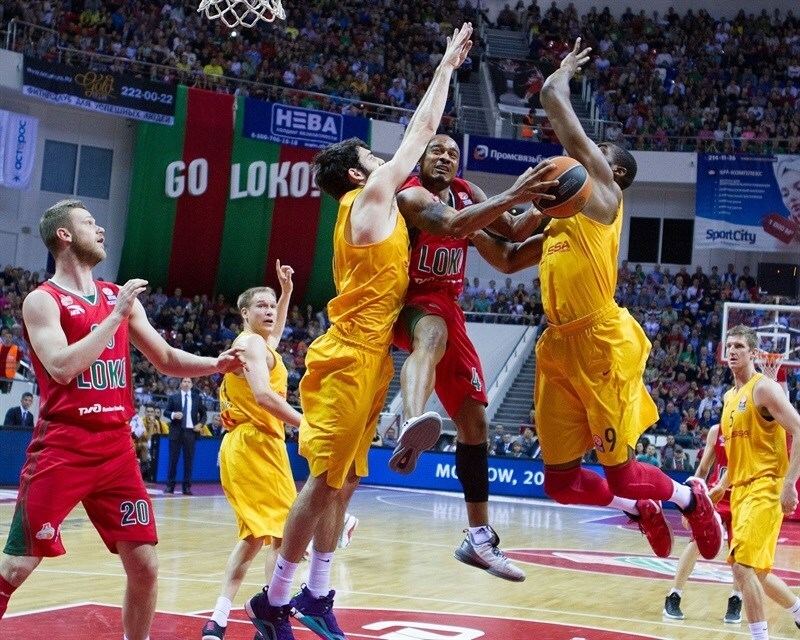 It is not easy to go from south Russia to the Final Four. Today there are not many things to say about tactics and strategy. I would like to dedicate this to our fans, because this atmosphere here today wasn’t a typical Russian atmosphere. The fans helped us step up our game when it was tough. Barcelona has the quality and very soon they came back from an 11-point deficit and they were up 5, I think. So we had one more time in this game to show character, mental toughness. We showed it, all the players helped a lot; Chris was one of them. And finally we won this game. 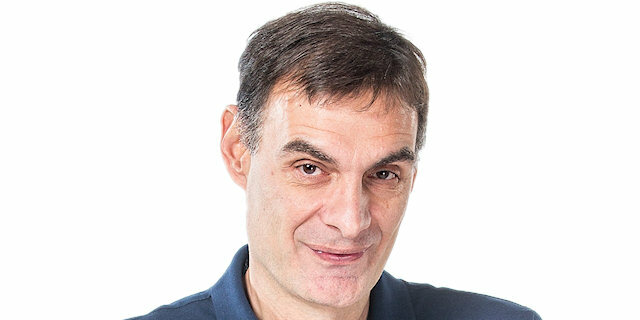 It’s not easy to [beat] Barcelona four times in a season, Panathinaikos three times, Efes two times. We made some amazing performances and great wins this year and I think we deserve to be in the Final Four, especially the way we did it. I have to say congratulations to Barcelona; they have a great team and a very famous club. " "It's a pride-like feeling. Not many things to say. Just congratulations to our crowd and our club. It was a great job this year. We were very consistent in the game, even when Barcelona played excellent in the third quarter. We stayed focused on our game plan and finally we won the way we wanted." "Good night. 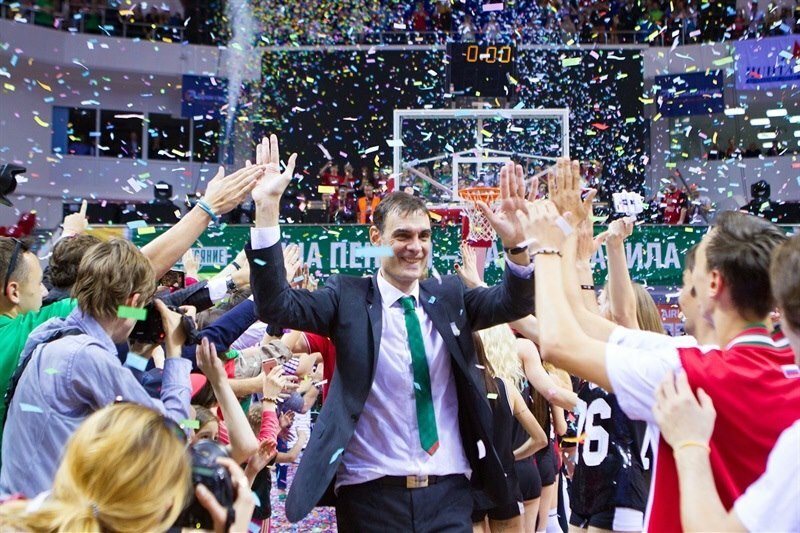 First I want to say congratulations to Lokomotiv for the victory and congratulations to Coach Bartzokas, as well as the club management and the fans. It has been a beautiful series from a sporting point of view. Today's game had different phases. First, we had lots of difficulty, defensively, entering the game. 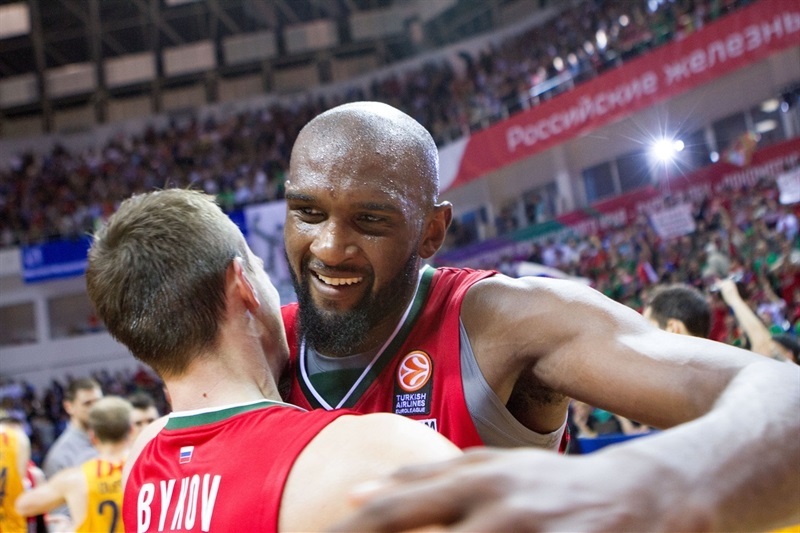 At times we were able to withstand the great play of Lokomotiv, who shot very well today. That was until halftime. In the second half, we dominated the third quarter and turned around the scoreboard. And when we were in a position to try to take the game, the rim closed on us, we committed two turnovers in a row and we couldn't make shots in the last quarter. And that was the reason we lost this playoffs." "It's clear that we didn't know how to take advantage of the home-court advantage we had to close the series. We had that opportunity in the fourth game, after winning the second one here, but like today, we couldn't make shots in the last quarter. It has been a beautiful series, as I said, and we had our options to win it." "I'm so happy to be part of the Final Four and going to Germany. Thank you to all the fans that came out. It's been a gr year. Hopefully we can try to win a championship. It's Game 5: you've got to leave it all on the court. It's win or go home. I got open shots: I made them. I was just being aggressive and believed in my teammates." "It was an up-and-down game. We made runs, they made runs. And our defense prevailed in the end. It was a final game. We left it all out tonight. I just took the shots I normally take and they went in… We knew it was going to be competitive. The series was tied, so this was the deciding game. We knew we were going to take their best shot. We gave them our best. It wasn’t our best game, but we won the game. "